If superior deck framing is what you need then you’ve come to the right place. We offer Trex Elevations steel framing and pressure treated Southern Yellow Pine. These two products are preferable to other framing materials, because of their strength and durability. Trex Elevations works well with all Trex Decking products including Trex RainEscapes. And our pressure treated Pine is resistant to rot, mold, and decay. Swap wood for steel to create a remarkably stable and consistently flat structure on which to build a high-performance deck–something a warp- prone wood deck frame could only dream about. Wood framing splits, warps and shifts over time, leading to an uneven surface in the deck boards above. The dimensionally stable steel of Trex Elevations stays in place, giving you consistently flat decking. ProWood framing pressure-treated lumber is so easy to work with, great to look at, and stands up to the toughest conditions. 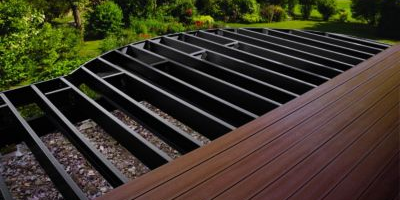 With ProWood framing, finish any deck in style by customizing your look with our pressure-treated components. They’re not only environmentally friendly and resistant to termites and decay; they’re durable, functional and beautiful. Dura-Color is the latest advancement in pressure treated lumber. Dura Color is treated with an EPA-registered waterborne wood preservative system and is backed by a lifetime limited warranty against termite attack and fungal decay. ©2016 Copyright - Fence & Deck Supply. All Rights Reserved.